Singapore (9 October 2018) — ASUS Republic of Gamers (ROG) today announces the ROG STRIX GL12CX, a full-featured factory-overclocked and liquid-cooled gaming desktop featuring up to the latest eight-core 9th Generation Intel® Core™ i9-9900K processor and NVIDIA® GeForce® RTX graphics. The 9th Gen Intel® Core™ processor is fully unlocked for further fine-tuning via the ROG Armoury Crate software, which also lets users customize the Aura Sync lighting inside and out. To complement the hot-swap SSD bay demanded by esports tournaments, there’s an innovative DIMM.2 module that can hold dual SSDs cooled by dedicated heatsinks. With cutting-edge components and extensive connectivity housed in an easily upgradeable design, the ROG STRIX GL12CX offers a jaw-dropping gaming experience today with room to grow into tomorrow. The ROG STRIX GL12CX is built with the most powerful components available, starting with the best processor for gaming: the new 9th Gen Intel® Core™ i9-9900K processor. With 8 cores and 16 threads, the new Intel processor is capable of delivering high-frame-rate gaming while simultaneously live-streaming, recording gameplay, and juggling chat and other applications. It’s also ideal for creative professionals, delivering incredible performance in multithreaded workloads such as rendering, transcoding, and other tasks. Only the best processors make it into the ROG STRIX GL12CX. Each processor is subjected to a series of stress tests to ensure the high factory overclock. A custom Cooler Master CPU liquid cooler, along with an extra 90mm fan at the back on the overclocked models then help to keep processor temperatures in check, preventing heat-induced hitches and slowdowns in performance, all while operating at a stunning 4.9GHz overclock on all cores and threads. The ROG STRIX GL12CX has sharp angles on the front and top of the case, evoking the gashes on a katana on armor. The included Armoury Crate software allows for the customization of the RGB lighting that spills out of the intake and exhaust vents. ASUS Aura Sync technology also allows users to synchronize the system lighting with compatible peripherals such as mice, keyboards, and even monitors. The Aura Sync lighting can also reach to in-game events and environments in compatible games such as the new Call of Duty: Black Ops 4. The ROG STRIX GL12CX has a hot-swap SSD bay — developed for E-Sports gaming — that’s hidden behind the case’s magnetic front cover, allowing for quick swapping in of profiles and games without needing to shut down the system to install a new drive with the required tools. The hot-swap bay also greatly simplifies storage upgrades for all users. Finally, the ROG STRIX GL12CX includes the innovative ASUS DIMM.2 module that slots into the system’s new Z390 motherboard. This expansion card uses a memory-style slot to provide two M.2 connections for SSDs. Since heat can slow down the performance, the DIMM.2 module has integrated heatsinks for each SSD. These two additional connections allow for dual NVMe® drives and RAID configurations, or one can be used for expansion while the other can be used for Intel Optane™ memory to accelerate a large hard-disk drive (HDD). The ROG STRIX GL12CX was designed with extensive connectivity to support all gamers’ gear and needs. In addition to the front hot-swap SSD bay, other front panel ports include a 2-in-1 card reader, two USB 3.1 and two USB 2.0 ports. The ROG STRIX GL12CX also features an optical disk drive to serve any legacy DVD needs. The back offers a total of six USB ports along with five audio jacks and a digital S/PDIF connector for compatible receivers. The 802.11ac Wave 2 Wi-Fi card is capable of greater-than-gigabit speeds and also includes Bluetooth® 5.0 to connect to all the latest peripherals in supported low-energy modes, output to more than once device at a time and makes connections at greater distance and with greater throughput than before. To find out more about the ROG STRIX GL12CX, check out the ASUS Edge Up article. 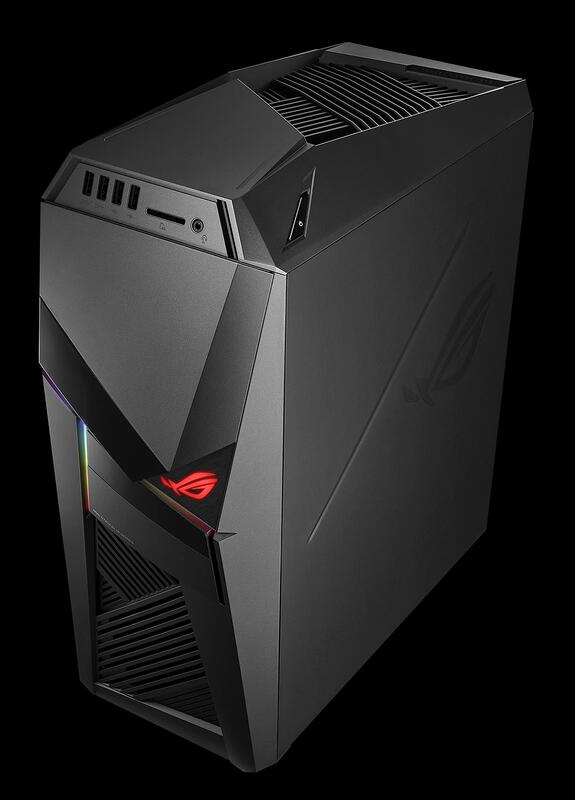 The ASUS ROG STRIX GL12CX will be available in Singapore in 2019.